Today we are introducing a new feature on the blog: Technique Tuesday with Debby Kratovil. 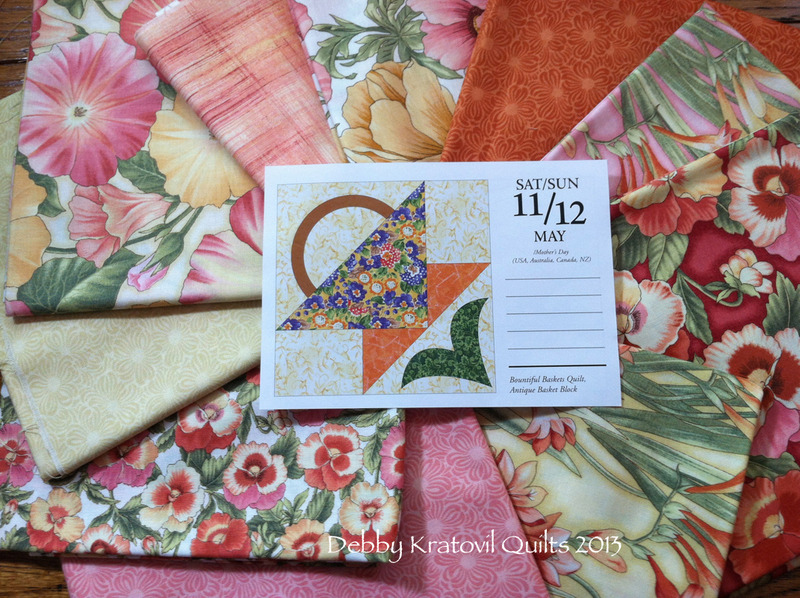 We are excited to have Debby sharing some of her favorite piecing tips and tricks with our blog readers, and we know you'll find the information she shares incredibly useful. I'm delighted to share with my Benartex visitors a quilt technique that has baffled many of us: How to set blocks on point. What are the magic numbers to cut those pesky side and corner triangles so they not only fit, but there are no bias edges along the outside edges? This is one of the most popular lessons I have ever offered. I begin with the Florabunda collection by Broadway Studios. Pretty, huh? 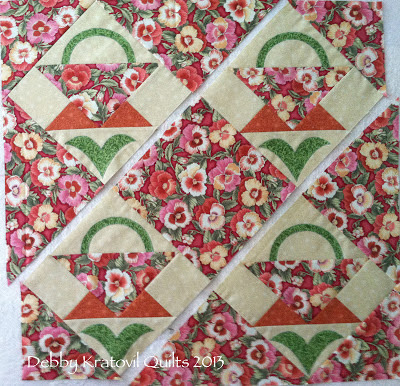 I wanted a green fabric for the basket handle and applique, so I selected a fabric from an older the Benartex collection called Katie. 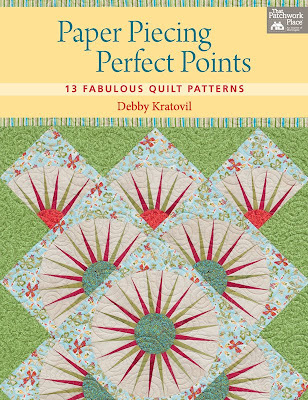 By the way, I used that Katie collection to make the quilt on the cover of my new book and I called it Katie's Garden. That was easy! 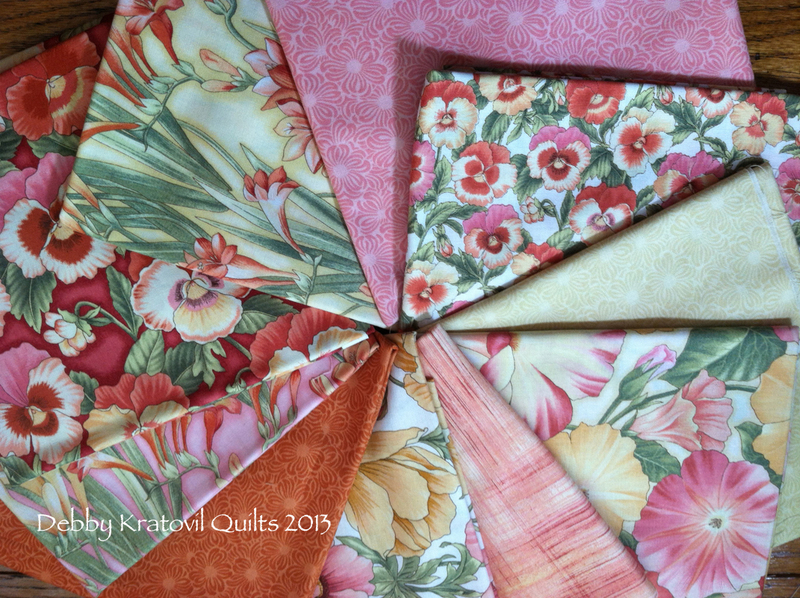 I selected two of the fabrics and auditioned each one against the block. I like the second one better. Time to take the plunge and CUT! There are two sizes of triangles to consider. The first one is the side setting triangle (in picture above). We cut a square that is the finished size of the block (10"), MULTIPLIED by 1.414 and then we add 1-1/4" to that number for seams. I have a handy chart at the end of this blog post, so hold on and stop rolling your eyes. This is math talk, not trash talk! Our number is a whopping 15-1/2" square. Each square gives me 4 side triangles (that's all I need for my 4 block quilt). 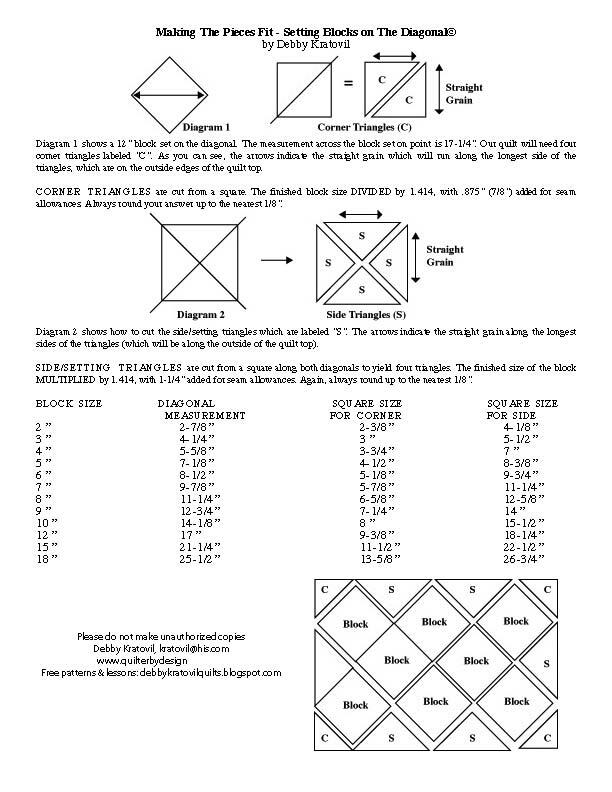 The formula for cutting the triangles for the four corners of the quilt: finished size (10"), DIVIDED by 1.414, then add 7/8" for seams. Now I'll show you how they look. The blocks are joined into DIAGONAL rows. The side triangles (there are 4) are added to the top left block, and then the single corner triangle. Press seams toward the floral triangles. When you lay out your pieces as shown in the diagram below, it's easier to see the sewing sequence. Can you see those last two remaining seams left for me to do? 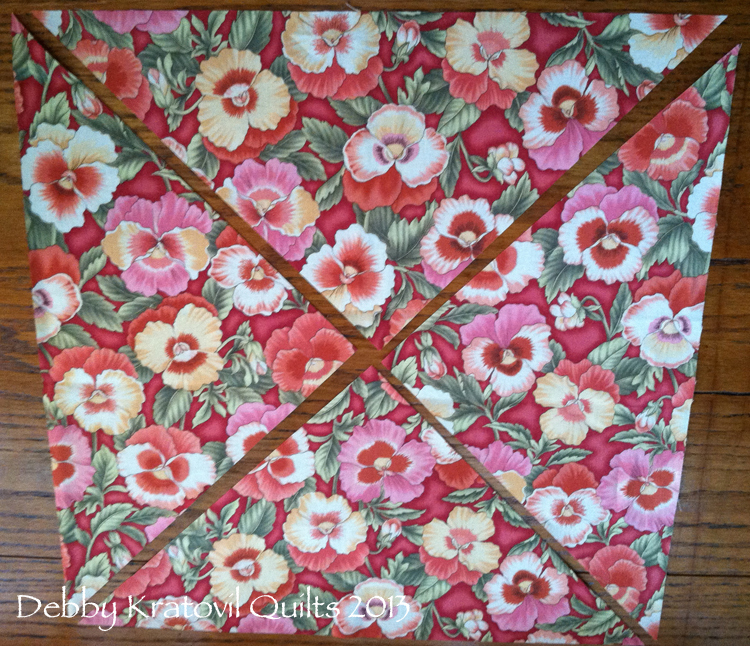 I will sew those last two seams and then press them open to reduce bulk. When you consider setting your blocks on point, it opens up some wonderful setting options. I will answer a quick question you might have about the seam allowances I quoted above. 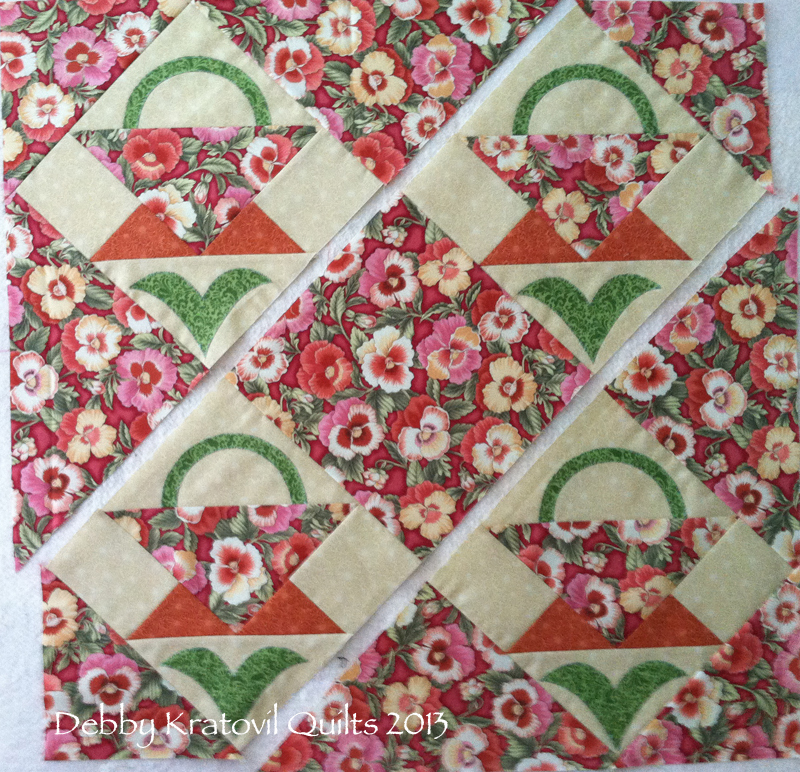 When a square is cut into FOUR TRIANGLES, you always consider the block size it will work with. 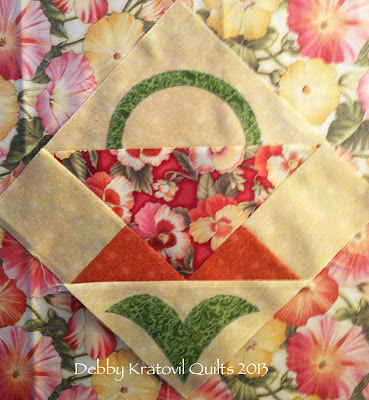 And, you always add 1-1/4" to the size of the cut square so that it will fit the block or unit it is to go with. 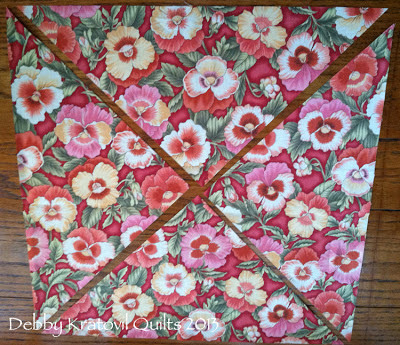 When a square is cut into TWO TRIANGLES, you consider the block size and only add 7/8" for seam allowances so it will fit with the block or unit it is paired with. Here is my handy, dandy chart with formulas for standard sized blocks. And I've done the math for most of them; just find the block size! 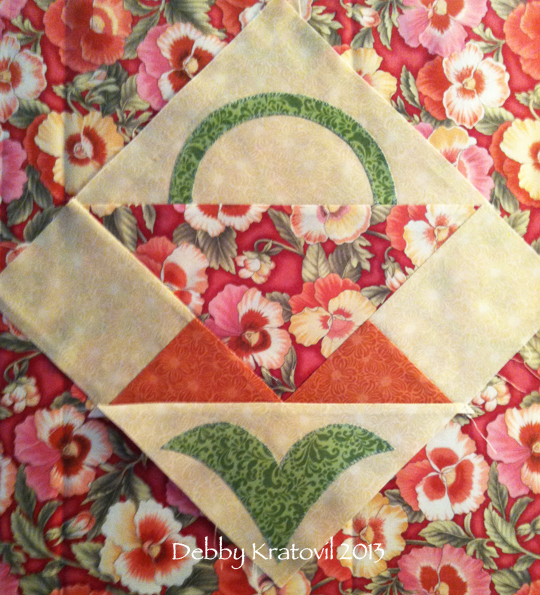 You can download this chart and print it out; then hang it up in your sewing room! I've printed off the chart and pinned it on my sewing room wall! Thank you for the chart, Debby. Technical Tuesday is going to be a event! This I can use; thanks so much. I also love that basket block; the embellishment makes it unique. Perfect timing! I just pulled out a UFO and am adding the sashing now and then was going to try and figure out how on earth to cut those edge triangles to set the diagonal rows. yay! Now the work is done for me and I can just cut & sew - thank you!! Back with a question --- what about when blocks are sashed? 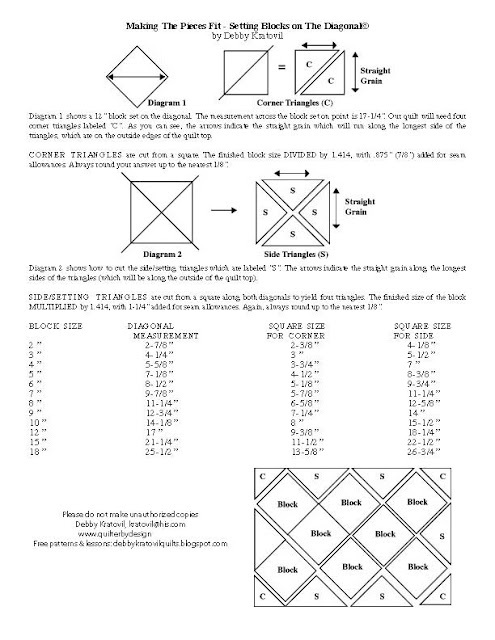 I did a quick google search which says add 1 unit of the sashing measure (so an 8" block, finished, with 2" (finished) sashing becomes a 10" block and then use the same formula/method) -- is this correct? Hi. I will have the Benartex blog moderator also send you an email so you are sure to get this response. Yes, if you've sashed the block and it's now a 10" Unit (8" block size PLUS the added strips), what you need to set on point is a 10" square. You work with that number for getting the correct triangles for sides and corners. Good question! 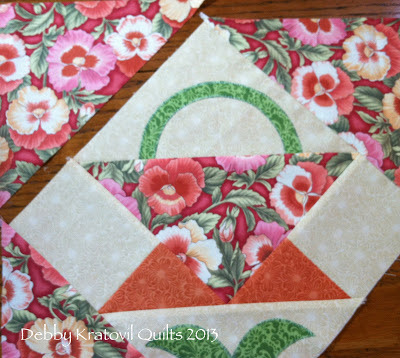 Love that fabric collection and your post has me thinking about yet another basket quilt. I love baskets! Thanks! Your tips have been very helpul and I downloaded the chart for referencce - thank you!! It's time for...Christmas in July!